Nancy, what’s the story behind the title of your book? I’m glad you asked. Years ago, when I was still working in radio, we had a story on the air about the murder of a young model/wannabe actress. It was believed she may have agreed to meet with a photographer for a photo shoot at a remote location and that the photographer murdered her. The police questioned a number of local photographers – my brother-in-law included – as both he and others had all done shoots with the girl in the past. Ultimately, the police arrested a man who had been impersonating a photographer and charged him with the girl’s murder. The idea that I might have actually known one of the suspects stuck with me over the years. So when I was thinking about a plot for Reason To Doubt, this idea was ripe and ready. And adding to the suspense just had to be the idea that Carol’s daughter would return from her freshman year at college with a photographer boyfriend in tow. All of the Carol Childs Mysteries work as standalones. There is a cast of characters, Carol, her best friend Sheri, Carol’s boss Tyler, and several others that return in each book. But each book is its own complete mystery. I was born in Seattle, Washington and moved to Arizona, via Colorado when I was a little girl. After college, I lived in Europe for four years before coming to California, but I’m a west coast gal, and California’s in my blood. I enjoy the diversity of the people and the climate. I’m a warm weather type of person. I live in California! That’s synonymous with earthquakes. I’ve been through a few. Shake. Rattle and roll is what we do. My dog. I’m an animal person, so if anything were to happen to our home, she’s the first thing I’d go after. I would have to quote my grandmother. She was always making up quotes for us to live by. "When in doubt, don’t!" was one of her favorites, and it was the basis for which I took the titles for the Carol Childs books. I’m working on a new series with Misty Dawn, a character I’ve pulled from the Carol Childs Mysteries. When I finished Reason To Doubt, Misty kept coming back to me, as my character do, and asking for a series of her own. As a former Hollywood Psychic to the Stars, and an aging senior who hadn’t planned for the future, because – psychics can’t read themselves and she never anticipated living to be a septuagenarian – she must now reestablish herself, and in doing so finds in the middle of a criminal investigation. Nancy Cole Silverman’s realization that she and Edgar Allen Poe shared the same birthday sparked her lifelong interest in mystery fiction. After a very successful career in the radio industry, she turned to writing, and her crime-focused novels and short stories have attracted readers throughout America. 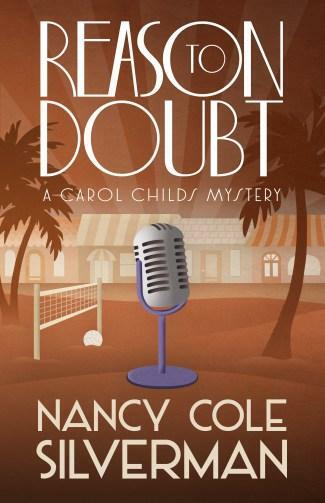 Her Carol Childs Mysteries series (Henery Press) features a single-mom whose "day job" as a reporter at a busy Los Angeles radio station often leads to long nights as a crime-solver. Silverman lives in Los Angeles with her husband and a thoroughly pampered standard poodle.